Now and then people contact me searching for fractional properties on Oahu. I'll run a search, usually finding no listings on Oahu and then check the neighbor islands. Maui, Kauai and the Big Island also have few, if any. A recent check showed Maui having fractionals available for 2-week periods per year. Fractionals can be for any time period that's legal per state and local laws. Customarily the fractional period is two months. Maui fractionals, at two weeks, appear similar to timeshares (usually having a one week interval per year). The Oahu MLS has an option to designate a property fractional. We prepared ourselves for the new wave of fractional activity in the early 2000's and it never happened. Newer real estate agents may not even be familiar with the term. 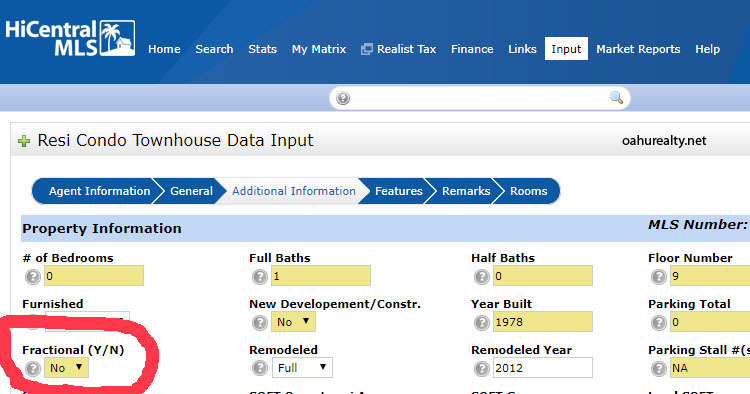 When we input listings, one of the questions is Fractional Y/N with a box to click. My guess is some people inputting listings check "Y" because it's a positive response, even though they might not understand the question. See the example below, this listing is properly checked "N". On the day this blog was written, I ran a search and found 33 Oahu properties listed as fractional. Looking through them, I saw that none of them are actually fractional. I spoke with the person in charge of MLS violations at the Honolulu Board of Realtors and asked it it's okay to tag them. 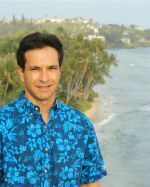 A potential violation gets reported to the Honolulu Board of Realtors (HBR) and then they contact the listing agent to make corrections or possibly fine the agent. The HBR person I spoke with said I can tag the violation, however it would be more neighborly to give the realtor a courtesy call and let them know. I understand her point, however there are 33 listings today, even if all of them are corrected there might be another 30+ listings a couple of months from now. Either way, the HBR or I would contact the listing agents. I told the person I won't report the violations nor contact the agents. Therefore, the "fractional" search function in the Oahu MLS is basically useless at this time. How can one identify a "real" fractional listing? First, the price will be significantly lower than other comparable properties. For example, if a house in a given neighborhood has a market value of $1,000,000 than a fractional property, say 1/4 of a year, would probably sell for around 25% of the full home's value. Secondly, the listing description should plainly state the property is being sold in fractions. Consider buying a property with friends, relatives and other persons whom you feel secure in sharing a property with. If that won't work, a legal vacation rental might satisfy you. And finally, look to properties in other areas that are less expensive. Contact me for more information!